Memset Review 2019: Is Memset a Good Hosting? Since their founding in 2002, Memset has become one of the go-to cloud hosting vendors for businesses in the United Kingdom. 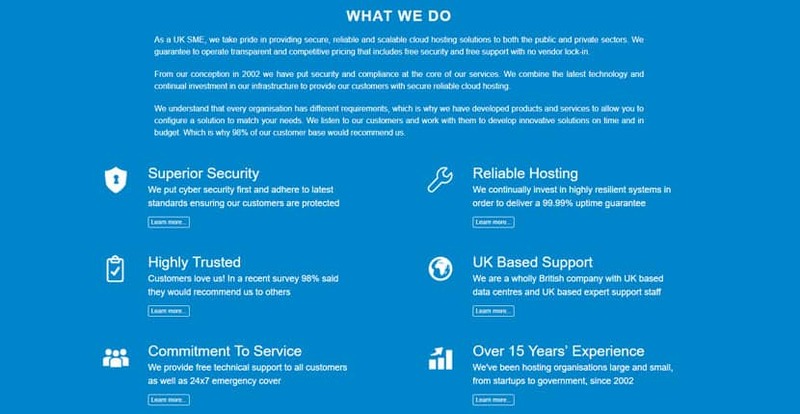 The U.K. web hosting company offers a variety of services for SMEs all the way to enterprise-scale operations, including cloud VPS, dedicated servers, and cloud IaaS. Memset was founded in 2002. Since then, they’ve grown to become a premier cloud hosting solutions provider in the United Kingdom. The company is committed to offering high-security hosting services using powerful, state-of-the-art Dell hardware and open source technology. Memset is a family-owned company trusted by over 2,000 private and public sector organizations across the U.K. to provide excellent hosting at affordable prices. The Memset website is only available in English. Since their small beginnings in 2002, Memset has always operated with a mentality of continual improvement and investment in their infrastructure. They offer three main types of hosting services for enterprise-scale customers, namely: cloud VPS, dedicated servers, and cloud IaaS. All Memset hosting options come with automatic backups, superior security, and an amazing 99.99% uptime guarantee. One of Memset’s unique features is that they’ve invested a ton into the security and compliance at the core of their infrastructure. They’re ISO-27001, ISO-9001, and ISO-14001 certified, and they’re one of the few certified commercial suppliers of IaaS cloud hosting solutions to public sector organizations in the United Kingdom. Memset’s cloud VPS solutions are designed for small to medium-sized businesses that have variable workloads. The idea is to provide these enterprises with the same level of control and security as dedicated servers, but use a virtualized server instead of a whole physical server. Memset offers two types of cloud VPS hosting: Standard and Premium. The main difference between these two types is the level of server management you require; users who want full control in managing their cloud VPS should opt for the Standard cloud VPS. Memset encourages organizations that have busy websites and complex analytics to go for one of their dedicated servers instead. These servers are some of the most powerful on the market and can be custom-fitted to your business requirements. Their cloud IaaS hosting, on the other hand, provides businesses with scalable storage and computer resources that enterprises only pay for by the hour. Memset has done a lot to ensure that their solutions are satisfactorily straightforward, ensuring that even small business owners just starting out on the web can use their services with few hiccups. That said, given that Memset is dedicated to offering hosting solutions to enterprises instead of individuals, the company doesn’t typically have to simplify their platform for beginners. This is because most of the businesses using their solutions would typically have an expert set up their websites. Memset is committed to offering high-end hosting solutions at a fraction of the cost you would pay with any other major hosting provider. All the company’s hosting plans include a free security suite that includes vulnerability and firewall management. They also include the latest high performance SSD storage and Dell technology. Memset’s decision to focus on providing hosting solutions to corporations instead of individuals may be the reason that their offerings are so well-fitted to businesses, and why the company is trusted by more than 2,000 enterprises in the United Kingdom. This vendor has no free version for any of their offerings, but their cloud IaaS solution has a 14-day free trial while their cloud VPS and dedicated servers have a 30-day free trial. Memset values excellent customer service. Their support team is highly trained to handle customer issues with courtesy, patience, and the highest degree of professionalism. The company notes that they regularly survey their customers to understand just how satisfied their clients are with their hosting solutions, then uses this feedback to make improvements. This is perhaps why their U.K.-based support center is one of the best I’ve come across. The conversations I had with the Memset support team were a delight and their ticketing system seemed to work seamlessly. That said, Memset’s live chat is only available during regular office hours. Customers with emergencies after hours can talk to the support team via the phone. Do note that while Memset’s managed infrastructure support is free, the company also has a paid managed platform support service for businesses that require high levels of support. onClick="trackClickout('event', 'clickout', 'Vendor Page - Visit User Reviews', 'Memset', this, true);"
I have used them for years, and been very pleased with them. There have been the occasional outages, almost always to do with network connectivity, but their communication about the issues has always been prompt and they have always been upfront about things. When I call them up they know what they are talking about and deal with things often when we in call. Memset’s hosting packages are specially designed for business organizations — particularly those with the most stringent security and compliance requirements. The company’s unwavering commitment to providing excellent cloud hosting solutions to U.K.’s private and public sector is clearly displayed by the excellent support they offer. Trusted by over 2000 enterprises across the U.K. Wondering how Memset stacks up against other Web Hosting companies? Enter any other Web Hosting company and we will give you a side-by-side comparison.